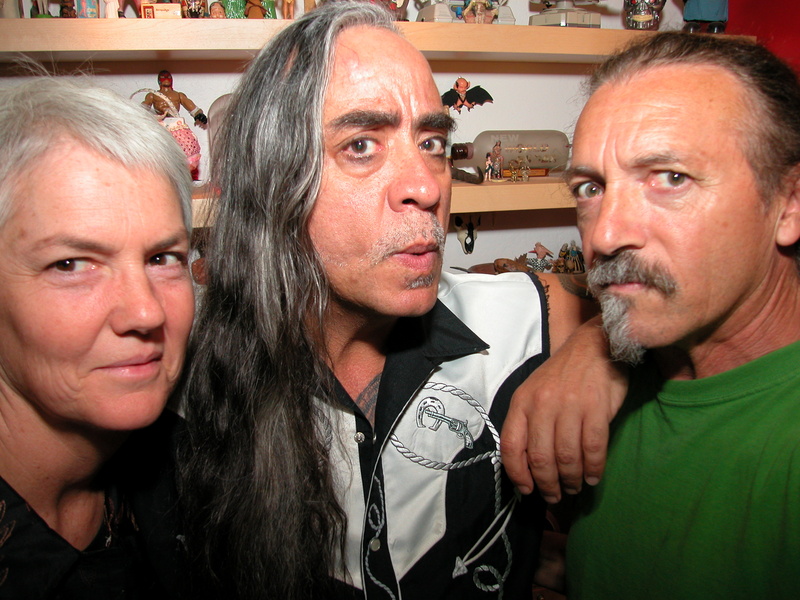 Felicia is contacted by Guillermo Gómez-Peña and Gustavo Vazquez about creating a book in response to a collaborative video already underway.The challenge is to find the relationship between these two time-based media. In March 2007 the three of them hold their first meeting in San Francisco. This leads to a series of brainstorming sessions held in either San Francisco or Santa Cruz that come to include Jennifer González and Zachary Watkins. The text is made up of Gómez-Peña’s performance scripts. Guillermo and Felicia exchange several iterations between 2008 and 2010 before the final set of scripts and their sequence is established. Gustavo’s and Guillermo’s video plays a role in the choice of scripts but the two are tied by sociocultural, political and historical issues of border art as addressed by Gómez-Peña, not by literal interpretation. 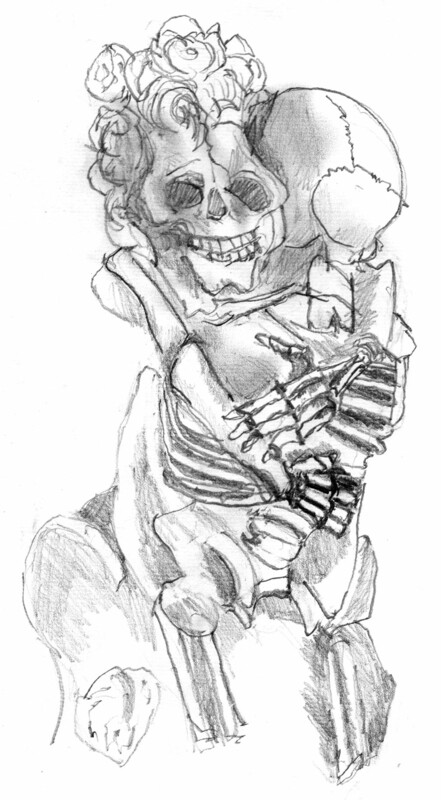 Between September 2009 and June 2010 Felicia completes a series of one hundred sketches drawn from Gustavo’s photos of Chicano juju in Guillermo’s collection. These form several layers of the prints on each of the 15 pages of the accordion-fold book. A sample printed page is delivered in May 2009 to the group. By fall 2010 the direction and scope of the project comes into focus and the printing of the book begins. 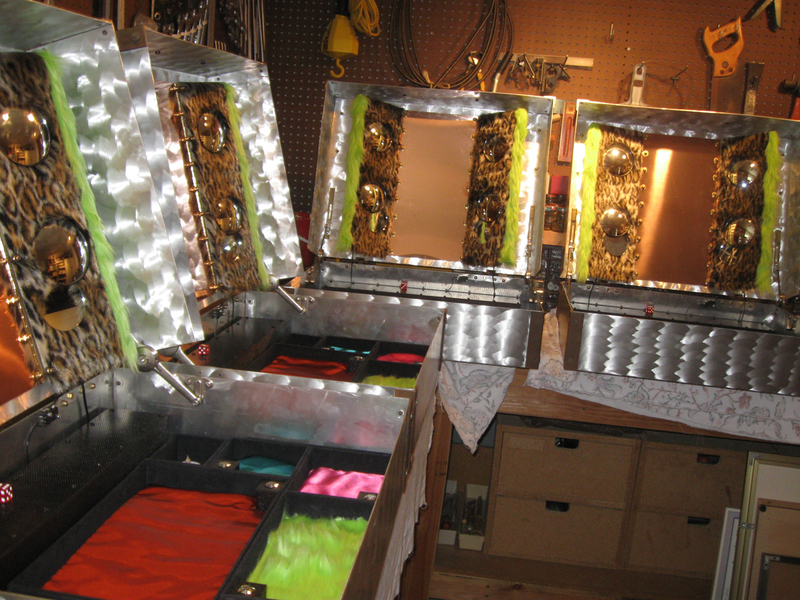 Receiving the Rydell Visual Arts Fellowship in March 2008 allows Felicia to develop a prototype of the hi-tech/low-tech aluminum book case and begin exploring the page treatments and binding structure for the book. These are displayed at the Museum of Art & History in Santa Cruz in the Rydell Fellowship exhibition from December 2009–March 2010. 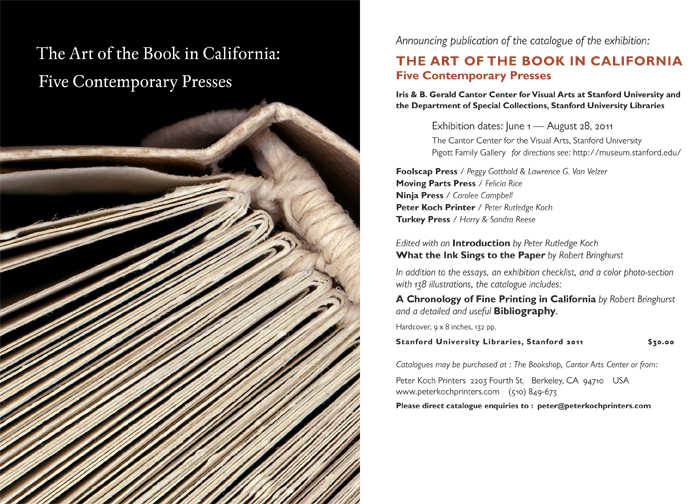 Building on the concept of the book as a performance piece, exhibitions of the work-in-progress take place regularly beginning in 2009 at the Sanchez Art Center; Cantor Arts Center at Stanford University; Pajaro Valley Arts Center; Art duJour Gallery; R. Blitzer Gallery; CODEXMexico; CAAM, Canary Islands; and CODEX book Fair. Details here. In summer 2010 Felicia begins printing the book. 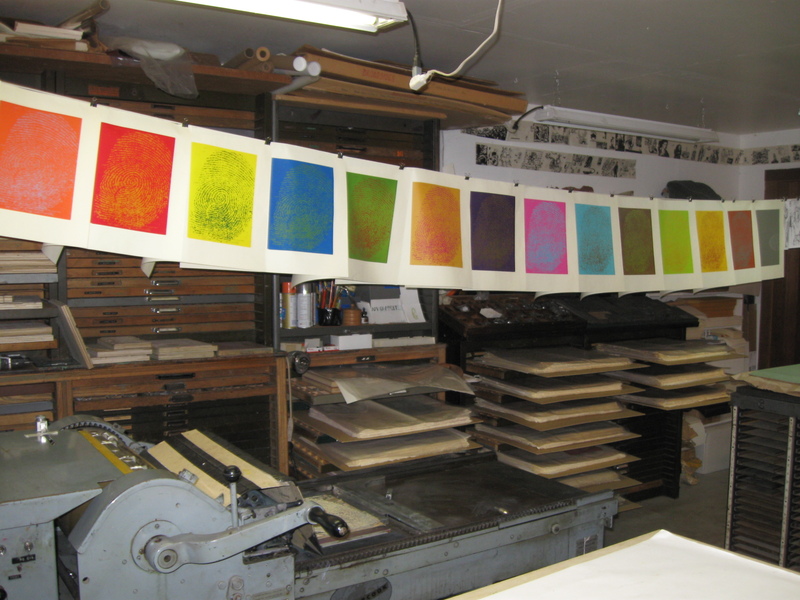 Each of the 15 pages passes through a Vandercook letterpress printing press one hundred times to lay down a single color. When complete Felicia names this stage, “The Myth of Fingerprints.” It establishes the color palette for the book and begins to explore the concept of identity central to the performance texts at the core of the book. On January 22, 2011 all five collaborators meet at ATA in San Francisco for a photo shoot with photographer David Crane. These photos appear in the book; they are also intended for publicity. 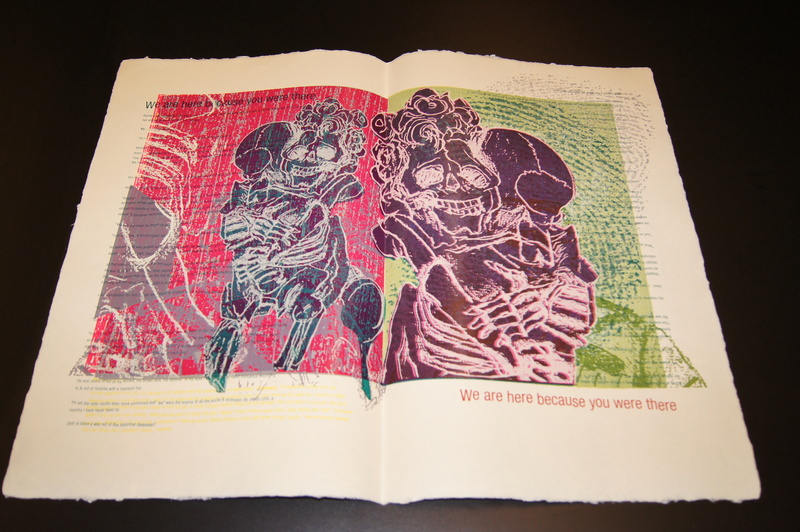 By summer 2011, the next state of each page of the book is complete, “Ghosts.” Drawings from Guillermo’s collection of juju overprint the “Myth of Fingerprints” in white ink. 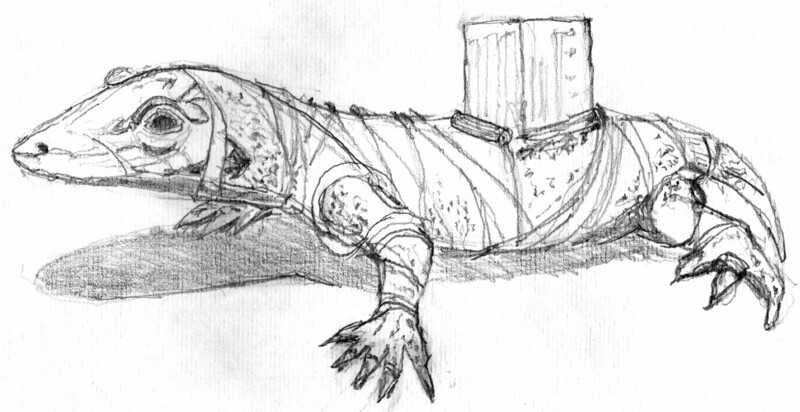 At this point the sequence of Guillermo’s performance scripts drive the choice of drawings very loosely. The drawings are intended to evoke Guillermo’s voice, interpreting it visually, performing the text. 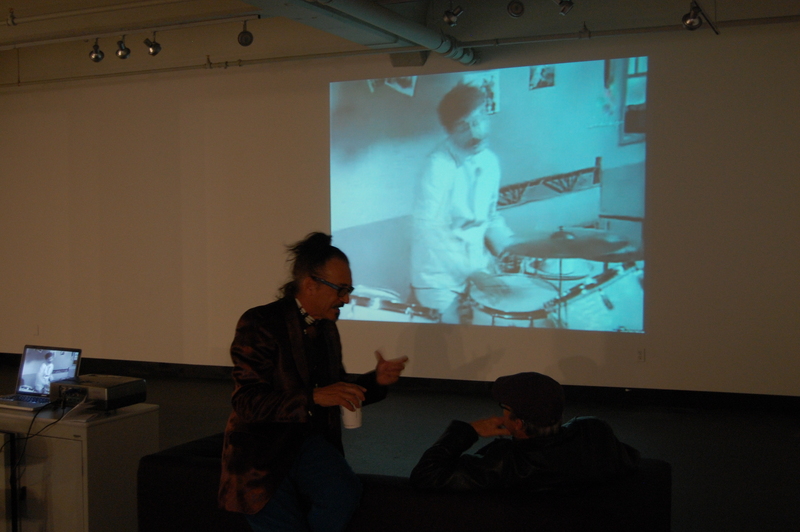 In August 2011, Felicia participates in the La Pocha Nostra Summer School at the Performance Art Institute in downtown San Francisco. The workshop is led by Guillermo and members of his troupe, La Pocha Nostra. She enters the two-week workshop with the intent of deepening her understanding of the book as performance art. She leaves convinced that her evolution as an artist includes performance art, the book artist as performance artist. In fall 2011 Felicia typesets the manuscript digitally using Adobe Illustrator and a plug-in, Text Pencil, that allows her to set each letter, one at a time, very much like handsetting lead type but with the ability to infinitely adjust the relationship between the letters. The lines of type flow and waver on the page. Documentado/Undocumented: Ars Poetica Shamanica, an evening of experimental video, live music, book printing and spoken word performances by all five collaborators takes place at SF Camerawork, San Francisco on December 8, 2011. This event is inspired by “Intox Lounge” a European-style event format featuring simultaneous activities at once with a busy bar. 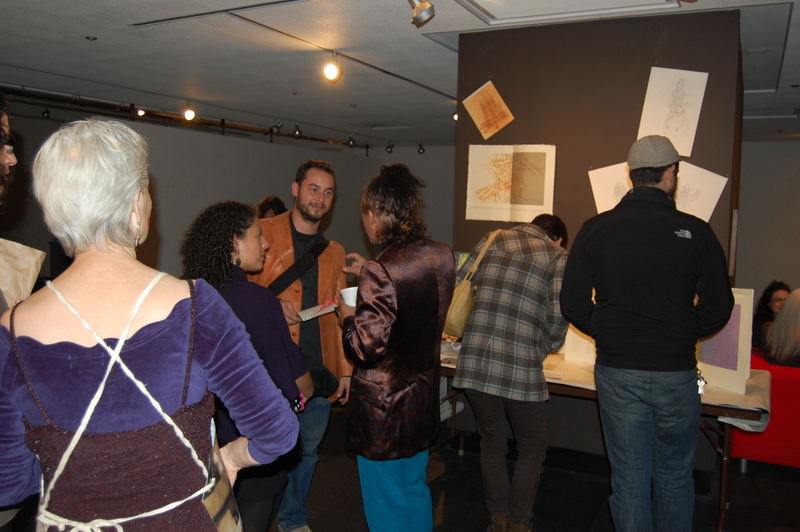 The prints created by the audience are incorporated into the book. 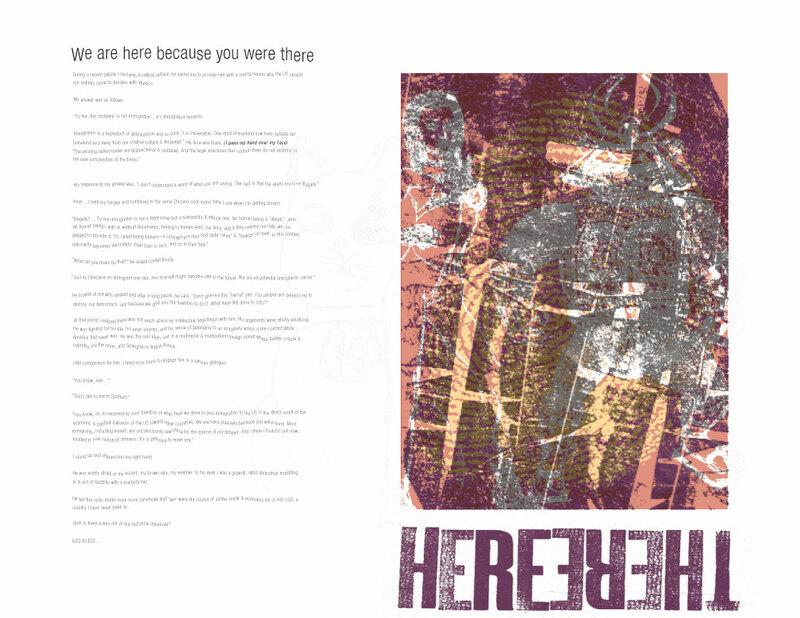 The year of 2012 is spent building the multi-layered prints that make up the pages of Documentado/Undocumented. Each page is made up of 25-30 press runs, laying down the colors or textures, multiple drawings, and type. Color and image dominate. The text sequence begins to shift as the images and colors, their size and dynamic, call out to one another from page to page. The pages are complete in the summer of 2013. In 2014 the final versions of the sound and video are delivered. The group evaluates the whole of the project and agrees to shorten (and lengthen) the title to DOC/UNDOC Documentado/Undocumented Ars Shamánica Performática, to address all of the elements of this artists’ book: book, video, sound, and case. 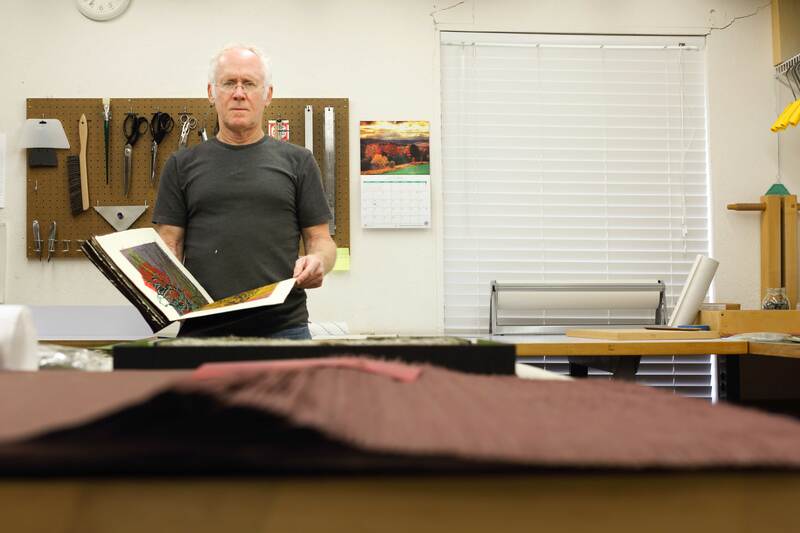 The first half of 2014 is spent on final design and production of the book binding (Craig Jensen, below) and the case (Sculpture Works with Mindy Padgett), including the electronics that run the sound and lights (Peter Elsea). Jennifer’s and Felicia’s essays for the pamphlet of texts that accompany the book are written, the pamphlet is designed and commercially printed. Myriad details must be resolved for final completion of the work. In 2014-15 the publication of the work shifts into high gear, filling orders, developing this web site, lining up exhibitions—making the work public. From this point on the book passes out of the hands of the collaborators and the publisher. Beginning in fall 2014 DOC/UNDOC belongs to the world. Thanks to everyone who contributed to the realization of this dream, collaborators, colleagues and friends. Art can be labor, just as labor can be art.